Undying love and a thirst for power, family grudges and unlikely alliances, loyalty and backstabbing – Game of Thrones is arguably the most popular drama on screen today and is about to start airing its final season. The end to the epic saga will likely be a bittersweet moment for those fans who would like to linger for longer in the enchanting dimension of heroes, misfits, royalty and villains. 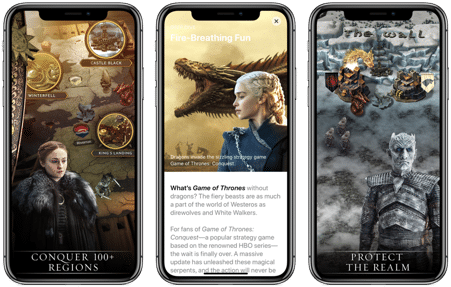 Game of Thrones Conquest and Reigns: Game of Thrones – two immersive iOS games available on the App Store – allow just that, bringing the magic into everyday life. These fire-and-brimstone, thirst-quenching iOS games bring all the cunning and furious action from the series and allow players to take the “reign” into their hands. There are critical decisions to be made, wars to be waged, revenge to be taken, and for the first time you can be the master of the Seven Kingdoms’ destiny. Game of Thrones: Conquest is a multiplayer strategy battle focused on commanding troops, assuring that the house you choose thrives and flourishes whilst securing alliances and conquering neighbouring regions. On the other hand, Reigns: Game of Thrones, a single-player experience, is all about the crucial decisions which the player must make on behalf of individual prominent characters to control the balance of power between the great houses and so direct the fate of entire nations.